The circuitry inside this baby was first used in the original ISA110 modules, designed by Rupert Neve for Air Studios, and now the Focusrite Red 1 for 500 series rack is now shipping. The Red Range was first released in 1993 and since then has gained an enviable reputation with top recording engineers and producers - it has been used on countless top tracks. One feature is its ability to handle almost any microphone. 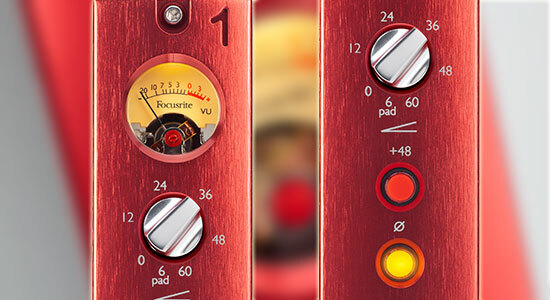 Featuring the same circuit topology and components as the original Red 1 mic pre designs and made in England, Red 1 500 offers the performance of the original Focusrite Red microphone preamplifier in a new, popular format: the 500, or “Lunchbox” portable modular system designed around API’s original console modules, ideal for mobile/location use as well as regular studio applications. Red 1 500, with its signature red anodised aluminium front panel, is perfect for those who remember the unique, stunning sound of the original Focusrite Red range, and want to bring that signature sound into the modern studio. Red 1 500 offers a compact interface to digital recording systems or for location recordings as well as convenient access in any control room.